Merry interview time with J.M. Frey! Today I have an amazing interview from author J.M. Frey. We talk about The Untold Tale, fandoms, fic, and other untold tales in life as a writer. But, first let me tell you more about the novel! Forsyth Turn is not a hero. Lordling of Turn Hall and Lysse Chipping, yes. Spymaster for the king, certainly. But hero? That’s his older brother’s job, and Kintyre Turn is nothing if not legendary. However, when a raid on the kingdom’s worst criminal results in the rescue of a bafflingly blunt woman, oddly named and even more oddly mannered, Forsyth finds his quaint, sedentary life is turned on its head. Dragged reluctantly into a quest he never expected, and fighting villains that even his brother has never managed to best, Forsyth is forced to confront his own self-shame and the demons that come with always being second-best. And, more than that, when he finally realizes where Lucy came from and why she’s here, he’ll be forced to question not only his place in the world, but the very meaning of his own existence. Smartly crafted, The Untold Tale gives agency to the unlikeliest of heroes: the silenced, the marginalized, and the overlooked. It asks what it really means to be a fan when the worlds you love don’t resemble the world you live in, celebrates the power of the written word, challenges tropes, and shows us what happens when someone stands up and refuses to remain a secondary character in their own life. No need to wait for Santa, you can get it now! 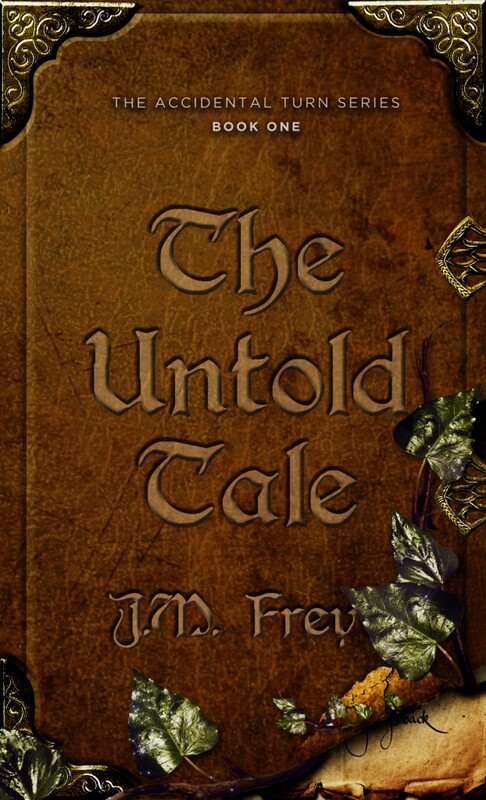 Q: The title of The Untold Tale has such a classic feeling. Could you tell us the story of how you settled with that title? The Untold Tale was originally “That Meta-Thingy”. After the first draft was done, I started searching the manuscript for a great line or phrase to use. I really liked the titles of books like The Knife of Never Letting Goor Where the Red Fern Grows, and I wanted something like that. But nothing in the book really stood out like that. I asked friends, asked beta readers, asked my agent. I think at one point I had a list of about fifty possible titles. I finally landed on Between the Lines and really adored that title, but when I Googled it, it turned out to be a Jodi Picault novel. Next I went with Untold, and that’s where the book lived for a few weeks, and then Sarah Rees Brennan released a novel with that title. I’d already had problems with people mistaking my Triptych for Karen Slaughter’s, so I wanted something unique. In the end, after about a year, my agent and I finally landed on The Untold Tales of Turn, and then in the middle of her shopping the book, I shortened it to simple The Untold Tale, because that’s what the book was, in essence. It’s a tale that hasn’t been told yet. And boy howdy, the process was just as loopy and frustrating for the next two books in the series, too. The Publisher’s Marketplace announcement lists them as “The Returned Tale” and “The Final Tale” but I didn’t think those were evocative enough. Those were I’m-panicking-and-I-only-came-up-with-these-story-ideas-and-titles-three-days-ago titles. Once I’d actually had the opportunity to discuss the books with my acquiring editor, Kisa Whipkey, and we’d decided what the next two books in the series would really be about, we started brainstorming titles. They ended up being The Forgotten Tale, and The Silenced Tale, and they literally could not be more perfect. Q: What is your favorite thing about fandoms? A: For me it’s the sense of community. It’s the tribe of it. I can (and have) look across a room, see a woman with a fan-art printed bag, and know, instantly, that this is a person that I will like and have something in common with. They say watching people read in public is like seeing a book recommend a person. With fandom, it’s the same. It doesn’t matter who you are, what your age, gender expression, ethnicity, religion, sexuality, etc. if you are wearing a Stargate SG1 mission patch on your coat I know in an instant that you are someone that I will get along with. I also love the creativity that is expressed through fandom. I adore the idea of someone so moved by a story, so engaged that they can no longer simply passively consume it. They must seek out more, and make more. They have to write, or cosplay, or make art, or go to conventions, or RPG online. That’s stunning. And as a creator, that’s flattering as all get out. I really hope that people will be inspired enough by my work to create fanworks. I think there’s no better way of telling an author you love what they wrote. Q: After studying them for a while, have you noticed a change with how readers either react or interact? A: Well, I mean, the readers I studied for my MA were all internet-based; I began with research in Yahoo Groups before Tumblr was even a twinkle in its creator’s eyes. And the only really difference I see is that the intense and deeply engaged discussions are happening on public walls instead of in closed-room groups that can sometimes become echo chambers of bias, to their detriment. This means the discussion is open for anyone to jump into. Now, sometimes this opens the way for bullies, trolls, flamers (do we even use that word any more?) and douchecanoes, and I can absolutely say that I’ve seen a rise in the self-important entitled troll. But I’ve also seen a rise in diverse discussions, where people with differing opinions, or new information are welcomed into the thread and conversation, and their contribution is welcome, celebrated, fairly considered, and replied to politely. And I think that’s fantastic. Discourse can only be augmented by fairly reasoned, well researched, interesting additions. It’s just unfortunate that it’s also been joined by the rise of the entitled whiney trolls. Q: What advice could you give to people looking to add more diversity into their own stories? A: Ask yourself “why” more often when you’re creating your characters. For example, “Brian is a straight, white, man.” Okay, but ‘why’? What about this character Brian is inherently straight, or white, or male? Why does Brian have to be any of those things? Why is that the default? Why can’t Brian be Brienne, and not straight, and not white? Will it ruin the story? The thing is, the world is not homogenous, and groups are not monolith. The default is white, and straight, and male, and it should not be. The white straight male is a sliver of the population of the earth. It’s time to start making art that shows the rest of the human race as well. And once you’ve decided to make Brian different, be meticulous, fair, and as unbiased in your research as you can be. Figure out what the stereotypes are for Brian’s gender expression, sexuality, ethnicity, etc. and avoid them. Create a whole character, not just a caricature, and do it with as much thought and care as you would any “default setting” character you may write. And most importantly, do not tell the stories of diverse writers FOR them. Include diverse characters, but don’t co-opt their voices and experiences. Q: We’ve talked about fanfiction before, what sort of fanfiction would you love to see with your characters or worlds? A: I tried so hard to write the “how they got together” story for one of the couples in The Untold Tale and every single time I tried to write it down, I could never do what was in my head justice. In the end, it was removed from the book completely because it didn’t work with the novel’s single narrator POV. I would just die with joy if a whole spate of “how they got together” fics sprouted up! Q: In a few tweets, it’s been mentioned that there is another whole level under what is written that is filled with personal things like “I was on the train when I wrote this scene.” Could you tell us a moment of The Untold Tale that is soaked with one of these memories? A: What I was talking about that series of tweets was the nostalgia of rereading one’s own writing. Books are intensely personal because there is a lot of the author in not just the story, but because the creative journey is long and laborious, and when we re-read our own work we inevitably are also experiencing the memories of when we wrote that part. We experience not only the book, but where we were when we wrote that bit (or cut it out again). For an author, a book is not just a story. It is also an emotional time capsule of who we were, and where we were when we wrote it. For me, I think one of the scenes packed with the highest number of emotional moments for me is the ball at Turn Hall in The Untold Tale, where Pip dances with Bevel and Kintyre, and ends up telling them off. That rant was the very first thing I wrote for the book, and it came from an extremely long and infuriating conversation I had with a male friend where I tried to explain to him what it felt like to never be the intended audience. I couldn’t argue with him anymore, I was too emotional, so I fled into my office and ended up writing it all out. I came back to that scene a lot to recapture Pip’s rage, and so I read it everywhere – on planes, on trains, overseas, under the covers, and out loud at several workshops, coffeehouses, and reading series. And now there’s a new layer! I was out at a pub listening to the Steel City Rovers play, and they did an instrumental song called Aibhlinn’s Dance.About five bars into the song I burst into tears, and had to hide my face in my sleeves because the song was exactly what I’d had in my mind for the “Waves Upon the Shore Dance”, which Pip and Bevel dance at the ball. I was absolutely slammed with the memories of writing and reading the scene aloud, all at once. Now when I reread the scene, I hear this song in my head and it makes it even more perfect and emotionally gripping for me. Q: I know I’m really excited for The Untold Tale, what are some upcoming things you are excited for? In terms of stories, I’m pumped for Captain America: Civil War and the Sherlock: The Abominable Bride. And of course I hang on every page of Meagan Kearney’s Beauty and the Beast, and series two of The Riftworld Chronicles, if it ever happens. And I’m super excited to share the #SecretScreenplay project with everyone, once it’s complete and I can tell! Pandamoon Publishing Acquires Hello World!